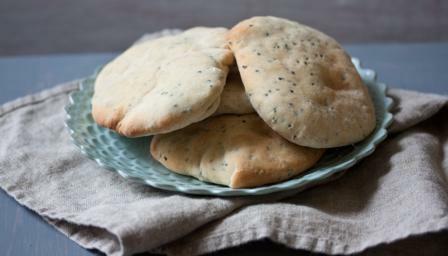 Freshly baked pittas are far superior to shop-bought and are amazingly simple to make. Try them stuffed with souvlaki or dipped into hummus. Pour a little oil onto your work top. Place the dough on top and knead for 5-10 minutes. The dough will be wet in the beginning but will form a smooth dough once kneaded. Once a smooth dough is achieved, place it into a clean, oiled bowl. Cover and leave to prove until doubled in size. Preheat the oven to 250C/475F/Gas 9 and place a clean baking tray or baking stone on the middle shelf. When the dough has doubled in size, tip it out onto a work surface dusted with flour. Knock the dough back by folding it inwards over and over again until all the air is knocked out. Split the dough into 4-6 equally sized balls. Roll each ball into an oval shape 3-5mm thick. Remove the hot tray from the oven, dust with flour and place the pitta breads on it. You may have to cook them in batches. Bake for 5-10 minutes, or until they just start to colour. Remove them from the oven and cover with a clean cloth until they are cool.